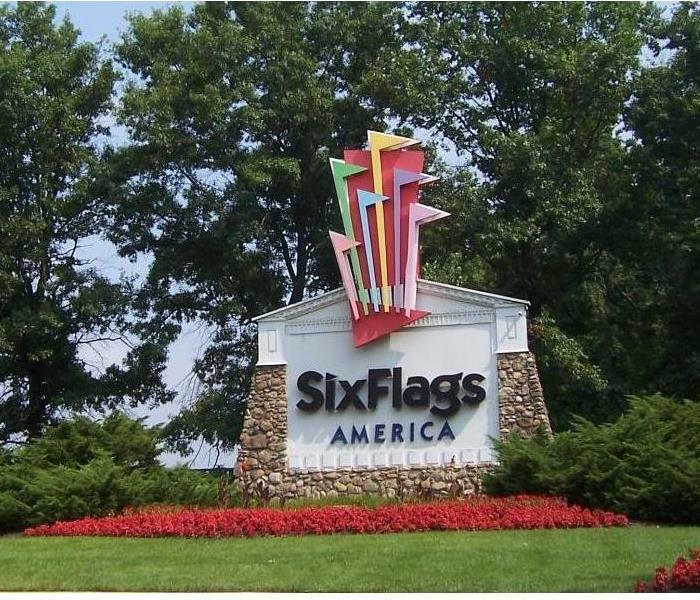 Our local Amusement Park was recently hit with some unwanted water and mold running through its administrative offices. There isn't a job too large or damage to severe for SERVPRO of Bowie to handle, however, so as soon as the call was received our team of professionals showed up to the scene with our industry-grade equipment in order to leave the place looking "Like it never even happened." A local church was recently hit with some unfortunate water damage from a heavy storm. As soon as we, at SERVPRO of Bowie, received the call we knew what needed to be done immediately. In a moments notice our highly-trained team of clean up and restoration professionals arrived at the scene, ready to tackle the issue, leaving our client's property looking new! What we believe started with an electrical spark, the damage that was present when the SERVPRO of Bowie team arrived at the scene was pretty major. Luckily for this Bowie resident, we were able to clean up the unfortunate mess back to almost pre-damage conditions. The customer was left satisfied! This local Bowie resident was faced with some unfortunate fire damage within their home. A lasting effect that is often forgotten when a fire occurs is smoke webs. Shown above, you can see how residues can form long chains of ionized smoke particles that assemble in corners which is where you can find the webs. Of course, no job is too big to handle for our professional clean-up team here at SERVPRO of Bowie and the resident was left with a clean, web-less home! When storms hit, we can scale our resources to handle a large storm or flooding disaster. This customer had some storm damage to tackle and made the right decision by calling SERVPRO of Bowie. We arrived on the scene promptly, ready to restore the home back to like "it never even happened"
This Bowie resident had to deal with some tough electrical fire damage. 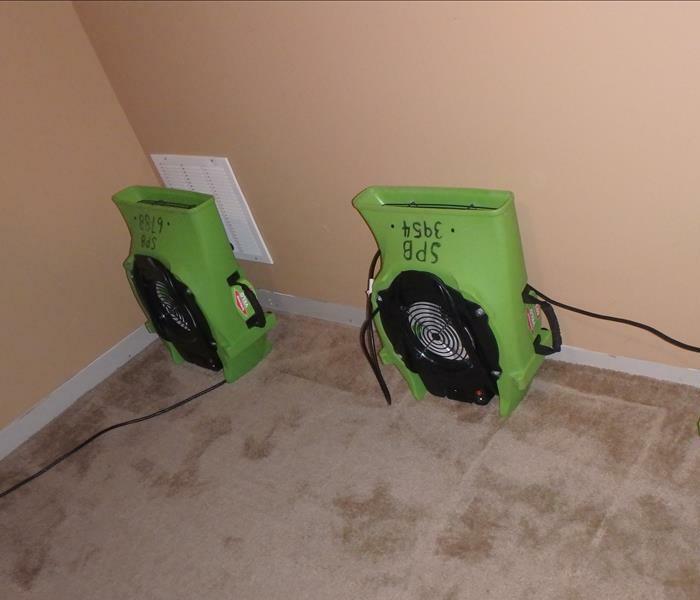 Luckily, SERVPRO of Bowie arrived on the scene with the best solutions to the problem. Always make sure to regularly check your home for any exposed wiring that may potentially cause irreplaceable damage. This Bowie resident sadly came home to some unexpected fire damage. Thankfully, SERVPRO of Bowie responded quickly and swiftly arrived at the scene to start the fire damage restoration. our specialized equipment can be seen taking care of the problem, leaving the home looking "Like it never even happened." Luckily for this Bowie resident, our certified and trained professionals at SERVPRO arrived at the scene ready to tackle the damage. Our specialized equipment for odor removal and deep cleaning had the scene looking like "it never happened"
Flooding can be a stressful issue to deal with, especially when it occurs in your own home. Luckily any potential damage from water leaks or pipe bursts can quickly and effectively be taken care of through the various services offered by SERVPRO of Bowie. Shown above is some of the helpful equipment used by our specialists to dry any excess water. Water damage and flooding can occur at the most inconvenient times and in the most awkward places. Luckily, the trained specialists at SERVPRO of Bowie are available 24/7 to help with all of your water mitigation needs. We’re here to help! SERVPRO of Bowie manages to maintain an excellent reputation for our services in major part by our amazing team of highly trained professionals. They work hard to tackle any type of restoration job that comes their way and get the job done! 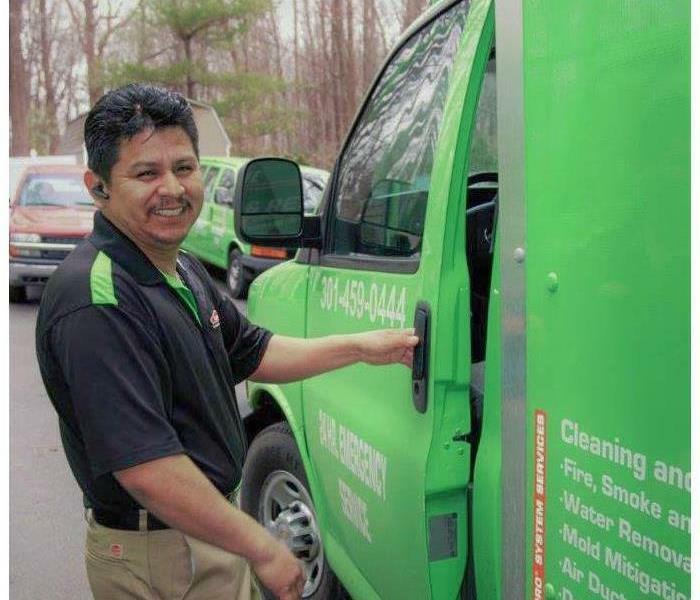 One of our most loyal team members, Abraham, has been with the company for over 18 years and is just one of the many employees who provide invaluable quality in what makes SERVPRO of Bowie great! If you find yourself running into water stains along your ceilings or walls, you are likely dealing with a leaky roof. Our team would have to remove the portion of the affected area and replace it. Once repaired, it’ll seem like there was never any damage in the first place! 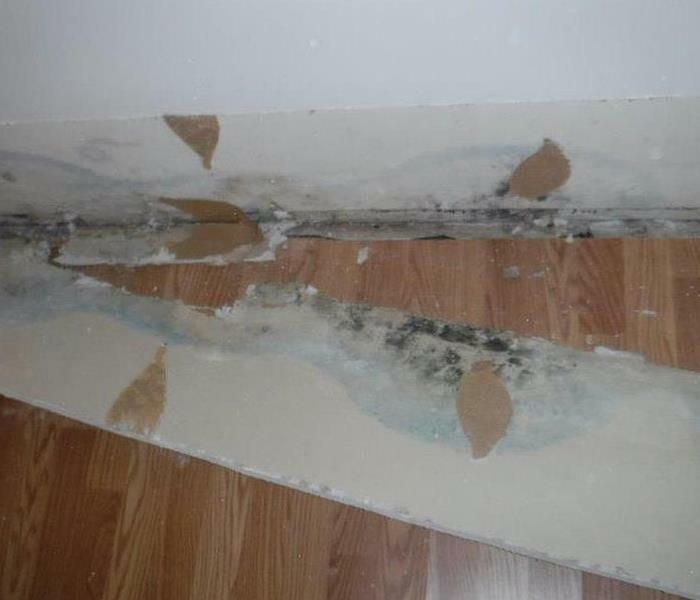 As it’s shown in the picture, major secondary mold damage can occur if initial water issues are not handled properly or within a timely manner. Luckily, no task is too difficult for SERVPRO of Bowie to tackle and our awesome team took care of the issue with no trouble! Structural and environmental conditions such as improper ventilation and temperature control, insufficient insulation and incomplete moisture removal can all contribute to mold growth in visible and hidden spaces. 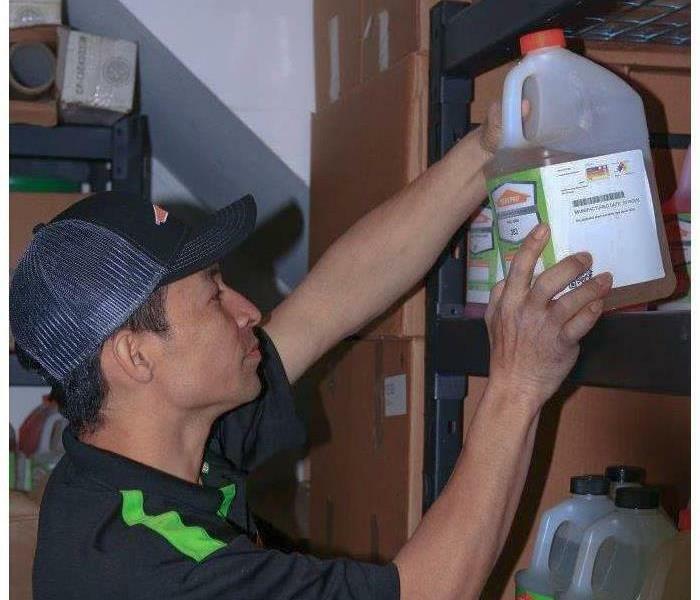 If there are any signs of mal-odors surrounding your home, it can be an indication of mold damage, which should be removed immediately by your local SERVPRO team to prevent further damage to the structure of your home.